With its big graceful lines and distinctive hump, the Boeing 747 long has been one of the world�s most recognizable airplanes. But a modification to the 747-400, currently being developed by a team of Boeing Commercial Airplanes engineers and international engineering design partners, promises to bring even more recognition to the venerable jetliner and the company. The 747-400 Large Cargo Freighter (LCF)�with a greatly enlarged fuselage, a �swing tail� that opens to accommodate major Boeing 787 Dreamliner sections, and a vertical fin that extends 5 feet (152 centimeters) higher than a typical 747-400�will turn heads when it makes its first scheduled test flight in mid-2006, leading to certification later that year. The LCF will have one basic mission when it enters service in early 2007: efficiently ferry large composite 787 sections, including major fuselage sections, wings and the horizontal tail, from supplier factories in Grottaglie, Italy; Charleston, S.C.; Wichita, Kan.; and Nagoya, Japan, to Boeing�s final assembly plant in Everett, Wash.
It�s a tangible example of Boeing�s commitment to new production system methods on the 787 program, marking the first time that Boeing jetliner production will rely primarily on airplanes for delivery of components. Moving major 787 assemblies by air could save 20 to 40 percent in cost compared to traditional shipping methods, and reduce delivery times to as little as one day from as many as 30 days today. Such savings will allow Boeing to recoup its nonrecurring investment in the LCF engineering modification during the first few years of 787 manufacturing, according to the program. Boeing achieved firm configuration of the airplane�s design in October 2004. Boeing engineers from the Puget Sound region of Washington state, Moscow and Canoga Park, Calif., as well as suppliers in Spain and the Netherlands, are hard at work on the detailed design. Major engineering design work is required to modify the freighter�s fuselage, which will help increase the volume of the main cargo deck to 65,000 cubic feet (1,840 cubic meters). That�s three times the cargo by volume than the 747-400 Freighter, the largest freighter in regularly scheduled service. 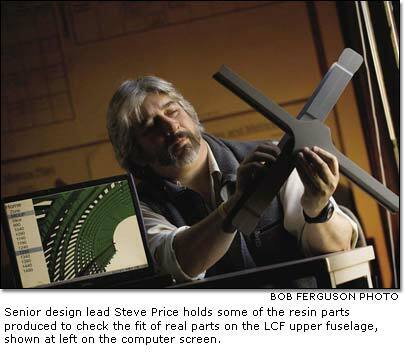 LCF Senior Design Lead Steve Price says challenges abound in designing the LCF�s bulging fuselage, which will be about 18 inches (45.7 centimeters) larger in diameter than the Airbus A380�s. �Some people have been referring to the LCF as an �ugly� airplane, but we have been able to take advantage of that in design,� Price says. He adds that because of the airplane�s mission, its detailed design does not require at least some of the expensive engineering solutions necessary in other airplanes. Cases in point: The use of doublers, or required extra layers of outer skin material, that are being designed for installation on the outside of the airplane rather than on the inside; and the use of button-head fasteners on the outside of the airplane in many places that would not be used in typical production models. Another challenge in the modification involves maintaining close communication with the team of engineers working on it at Boeing and around the world, Price says. Eleven time zones away from Everett, engineers at the Boeing Design Center in Moscow are helping design the freighter�s enlarged upper fuselage and rear fuselage, as well as the main cargo deck floor and �transition zone� that marries the new structure to the existing airplane structure. About 25 percent of all the engineering work on the LCF fuselage and up to 60 percent of drawing preparation for specific disciplines will be done in Moscow, says Timur Dyablov, LCF program manager at the BDC. Dyablov says much of the LCF fuselage design incorporates a new concept referred to as Monocoque with Integral Shear Ties. The concept involves a new method of transferring stringer (lengthwise reinforcement) load to the frame without separate clips or shear ties and takes advantage of high-speed machining advancements, simplifying the assembly process, requiring fewer fasteners and less tooling. �Our team in Moscow is really proud to be part of this important and exciting program,� Dyablov says. In Amsterdam, engineers at Stork Fokker are assisting in the design of the pressure bulkhead that separates the pressurized flight deck section of the airplane from the unpressurized cargo area. The bulkhead, which will have a waffle design when complete, will be manufactured from 75,000 pounds (34,000 kilograms) of raw aluminum stock, according to the program. Boeing engineers have designed a 5-foot extension to the airplane�s vertical fin to aid pilots� control during flight, but no design changes are necessary to the freighter�s wings. In addition, a conical-shaped aft fuselage extension will add 10 feet (3 meters) to the airplane�s length. 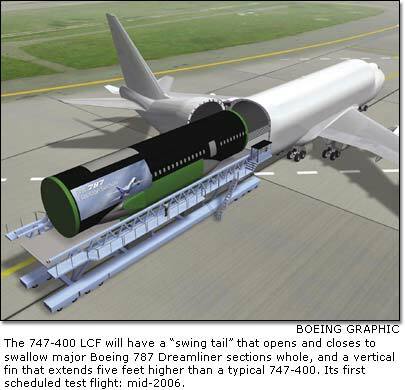 One of the more unusual and critical design challenges involves the �swing zone� of the freighter, the part of the aft fuselage that opens to allow loading and unloading of the 787�s large composite structures. Bruce Whiteman, lead engineer assigned to the freighter�s swing tail development, says that after landing, the LCF�s entire tail section, supported by independent ground support equipment, will swing out to allow easy loading via custom-built cargo loaders. The cargo loaders will raise the huge 787 sections to the airplane�s floor level and slide them into the unpressurized fuselage. Two pull-in actuators and numerous latches are involved in the proprietary system that opens, closes and locks the swing tail in place, Whiteman says. The latches, originally designed for a proposed folding wing on the Boeing 777, will be activated only by the ground support equipment and are specially designed to assure that the swing tail always is latched and locked when in service. �There�s a ton of work in the design and qualification of the pull-in, latch, and lock actuation and control system, and in coordination with our supplier partners,� Whiteman says. In February, Gamesa Aeronautica of Spain began providing engineering support and analysis to Boeing on the design of the hinges and other aspects of the freighter�s swing zone�essentially the area about 10 feet forward and 10 feet aft of where the airplane will swing open for loading. It�s an area that will require complicated, �dense� structure to handle the airplane�s load requirements, according to the program. Once the design work is completed, the components and systems will largely be provided by current 747 suppliers. Parts will be shipped to Taiwan, where the airplanes will be modified beginning this summer by Evergreen Aviation Technologies Corporation (EGAT) at a maintenance hangar adjacent to Taipei�s Chiang Kai-Shek International Airport. Cat Felker, LCF Quality team leader in Everett, is helping lead the effort to ensure that the people at EGAT are equipped with the information and processes they need to support the program and the tight production schedule. 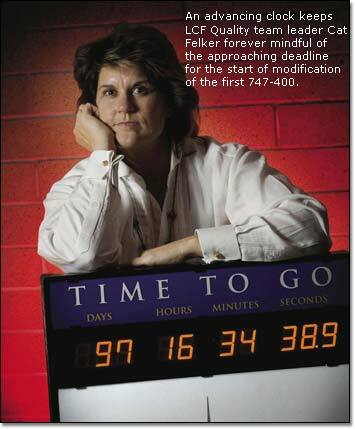 The LCF Quality team also is working to make sure that all Federal Aviation Administration requirements associated with obtaining the �amended type certificate design change modification� for the freighter are understood and supported, Felker says. 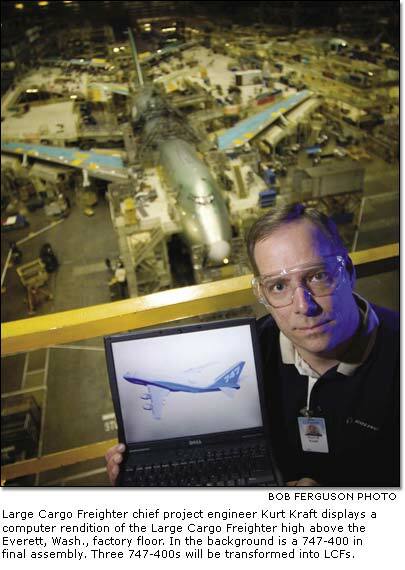 The 747 already is a tremendous source of pride for Boeing employees. The level of pride may be even greater for the team of engineering designers and support staff currently working on modification work associated with the 747-400 Large Cargo Freighter.